Gorgeous lab diamond stud earring jackets surround your stud earrings with a halo of sparkle. Made to order to fit your specific studs, or can be paired with any pair of Ada Diamonds studs. Available options: platinum, 14k or 18k gold: white, yellow, rose. 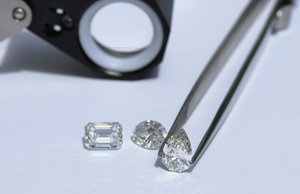 Design your custom earrings with our approachable diamond experts, and see why our 21st century design process is redefining the diamond industry. Ada Diamonds Design Description- These stunning earring jackets feature a brilliant halo of lab grown diamonds are made to order to fit your specific studs or be paired with any pair of bespoke Ada studs. Available in 14k white, yellow, or rose gold. Starting at pricing for jackets assumes GH, VS diamonds set in 14kt white, yellow, or rose gold. Additional setting fees for 18kt: $150, platinum $300.